It's a documentary that follows four candidates as they relentlessly prepare for what has to be one of the hardest tests in the world: The Court of Master Sommelier's Master Sommelier Diploma exam. There are around 200 Master Sommeliers and in the world (here's the list) and of the 50 candidates who took the exam the year the film was produced, only six passed. Note that there are a few different governing bodies in wine (here's good post that reviews them) so there are also a couple hundred Masters of Wine in the world. But no matter how you slice it: Attaining this level of mastery is extremely challenging. "Wine #1 is a white wine. Clear, star bright. There is no evidence of gas or flocculation. The wine has a clear straw core, consistent to green reflections in the edge. Medium concentration of color. Aromas are lime candy/lime zest. Crushed apples. Underripe green mango.Underripe melon/melon skin. Green pineapple. This wine is bone dry. Crushed slate/crushed chalky note. Crushed hillside. There's white flowers almost like a fresh cut flower. White lillies. No evidence of oak. There's like a 'freshly opened can of tennis balls' and a 'fresh new rubber hose' I get. Acid is medium+, alcohol is medium, complexity is medium+. In conclusion this wine is from the new world, from a temperate climate. Possible grape varieties are Riesling, possible countries are Australia, age range is 1-3 years. I think this can only be one thing: This wine is from Australia, this wine is from South Australia, this wine is from the Clare Valley. 2009 vintage. Riesling from a high quality producer." And he's right. It's a Clare Valley Riesling. The movie does a great job sufficiently familiarizing the viewer with the fundamentals of wine and the Master Sommelier process itself so the movie can be easily understood and appreciated by everyone. For example, the movie does a great job breaking down how blind tasting (what they like to call "deductive" tasting) is made up of both sensory observations and being able to map what's they're seeing, smelling, and tasting to knowledge about what characteristics are present in different grape varieties and regions. While watching the movie I felt a reinvigorated interest in exploring parts of the wine world I'd previously ignored out of lack of familiarity. The most exploratory burst of interest I've had coincided with the WSET Intermediate course I took a few years ago (If you're in the Boston area I do recommend the program through Grape Experience). But comparing WSET Intermediate to Master Sommelier is like comparing tee ball to being up to bat in the World Series with 2 outs and nobody on down a run in an away game on a chilly late October night. That said, you'll never get to the World Series without first playing little league so the net effect of watching SOMM is that you'll be more likely to want to explore the wine world through formal education. 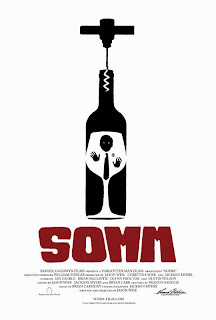 Overall I think SOMM is a fascinating movie. If you're into wine I think you'll love it. If you're not into wine you'll probably at least like it. Highly recommended.